Winter is more or less over and it is high time that you start preparing your house for the warmer months of the year. The period between October and March is when people’s homes usually tend to accumulate quite a bit of junk and unnecessary items. Due to the specific weather conditions, thorough cleaning is often neglected and homeowners tend to concentrate on the immediate chores. If you want to refresh your property and energise it, here is what you can do. Open all windows and doors possible, so that fresh air comes in. 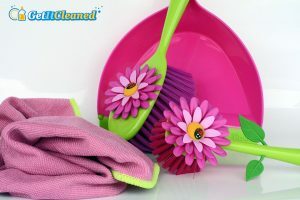 Dust all surfaces carefully and tend to high traffic areas throughout the home, such as the bathroom and kitchen, but do not neglect the rest either. Feel free to search for dependable deep cleaning in London offered by professional cleaners if you do not feel up to the task or you just would like to save time and energy. When conducting a spring cleaning of any scale, there are certain items and pieces of furniture that deserve the majority of your attention. Dust the tops of wardrobes, bookshelves and other areas that are away from your sight most of the time. Clean the mattresses in the bedroom in order to ensure a better night’s sleep. Clean the carpets and upholstered furniture thoroughly too. Have in mind that finishing up those tasks and the many more you will have on the agenda is going to take up much time. That’s why the best strategy is to set aside a whole weekend and sign up your family (and why not, friends) to help you do the job. Do not forget to thank them properly after – a nice dinner might be a good idea. Collect all the rubbish that you have accumulated in the past several months. Go through your clothes and sort out the ones that you will no longer be wearing. Remember to put away all winter garments and prepare the new ones. It is time to consider replacing old appliances too. You might want to invest a bit in new, energy efficient alternatives that will not only do a better job but will also save you money in the long run. If you are living in a house, chances are that you have an outdoor space of some sort. Even if it is just a small backyard or a garden, it is quite likely that over the winter months it has accumulated quite a bit of junk that needs to be collected and disposed of. Clean the patio furniture too, so that you can use it for outdoor parties during the weekends and the warmer nights that are to come. Last but not least, trim the hedges and trees to make them look better and stimulate their growth so that your outdoor space looks as good as possible.